You know how there are dream-weddings, and dream-homes, and dream-boats? Thanks for serving up a dream-headline on your front page today. It is all I could have asked for, and more. No matter what the results on this election night, it will be a headline that I will faithfully labor at bringing to life in the days, weeks, and months ahead. Thank you to each and every journalist, writer, activist, student, artist, leader, data sorter, organization, citizen, campaigner, doorbeller, phone bank monitor, media broadcaster (social and otherwise), rally-er, speaker, debater, public participant, and more, who have made such a headline possible, and with continued effort, attainable. 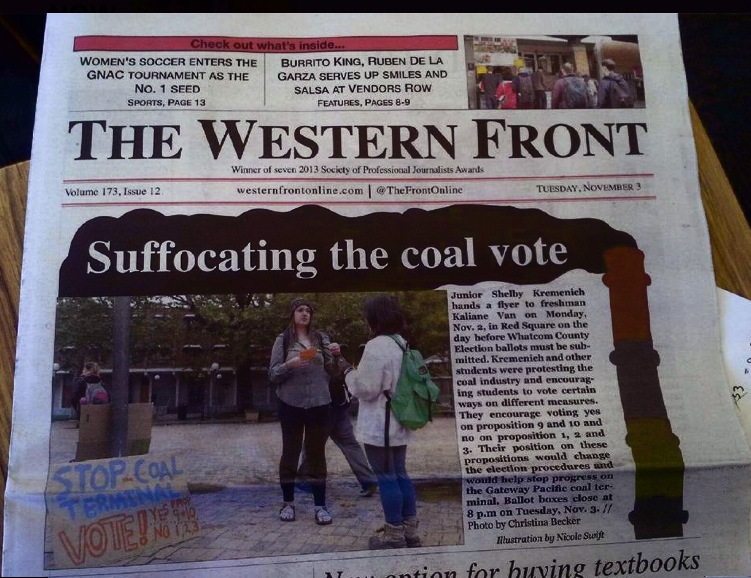 This entry was posted in Blog Post, Commentary, Information and tagged Coal, November 2015 Election, Politics, The Western Front. Bookmark the permalink.